San Francisco Bay Area Style - Fashion, Arts, Music, Entertainment, Food, Wine & More. Local author and blogger Erin McKean invites one and all to join her on Thursday, February 10 at the San Francisco vintage clothing store Ver Unica to launch her very first book - The Secret Lives of Dresses (inspired by her blog, www.dressaday.com/). The Secret Lives of Dresses tells the story of Dora, a 20-something college student who decides to put her life on hold to run her ailing grandmother's vintage clothing store. But is her life really on hold or perhaps taking an exciting new turn? Come on out, dress in vintage (or not), meet Erin and pick up a copy of this fun and inspiring new book. The Secret Lives of Dresses Book Launch. Thursday February 10, 2011, 6-9pm at Ver Unica, 526 Hayes St., SF. As part of their Go Forth marketing campaign, Levi's invites you to get to work with their series of print workshops happening now through August 28th. Located in a pop-up storefront in San Francisco's Mission district, the workshops offer opportunities for visitors to use old-school printing presses, create zines, design t-shirts, and talk with local print artists. Book artist and printer Taylor Reid works at Center for the Book and was hired by Levi's to demonstrate one of the on-site presses. She thinks these workshops are a great opportunity for the community. "I've noticed a growing appreciation for hand letter press," she comments. "It's not often people get to see printing in progress and do it themselves." Tramp or not, there’s something to learn from Mr. Blasberg’s primer on how to be a lady. A fashion reporter and NYC society party-hopper, Mr. Blasberg has observed many a faux pas, including the certain trend among young women to go bare under their skirts. (Oh dear, I have nightmares about that.) With his mid-western sensibilities and good manners he has taken on the tramps, determined to help them change their ways. In his book marketed to young adults, Mr. Blasberg offers advice on how to be a lady in every possible situation from traveling to hosting a party to falling in love. He also offers tips in how to dress like a lady; BTW, undergarments are a must. Everyone loves a good mystery. Everyone loves a good romance. Lucky for us, San Francisco author Merla Zellerbach has intertwined the two in her latest novel - Mystery of the Mermaid. Set in contemporary San Francisco, Mystery of the Mermaid tells the story of Hallie Marsh, an attractive 30-something businesswoman working in public relations. Hallie lives a modern life full of blind dates (courtesy of her socialite mother), best-friend chats, high-power meetings, and late night visits from her lover. When confronted with breast cancer and then a double mastectomy, Hallie embarks on a luxury cruise ship to South America for little R&R, but instead she finds mystery, mayhem and romance. Etiquette is a must, particularly while traveling. Certified etiquette consultant Lisa Grotts tells us what's proper and what's not in her new book, A Traveler's Passport to Etiquette. To celebrate Ms. Grotts' first published book a soiree was held in her honor on October 15 at Montblanc in downtown San Francisco. Attendees had the opportunity to visit with the author, purchase advanced copies of the book and have their copy signed by Ms. Grotts. Former San Francisco Mayor Willie Brown made an appearance commenting that he never knew so much about packing for a trip until he read this book. Intended for the well-traveled and novice alike, A Traveler's Passport to Etiquette emphasizes the golden rule - do unto others as you would have them do unto you. Listen up, Bay Area! Don’t miss this once-in-a-lifetime opportunity to meet White House Reporter Helen Thomas and Congresswoman and Mills College alumna Barbara Lee, appearing at Mills College in Oakland, October 12, 7-9. These two stylish ladies of politics will read from their new books and join in a conversation with Mills College President Janet Holmgren. For over 50 years Ms. Thomas has been sitting in the front row at White House Press Conferences politely but firmly asking pertinent questions of presidents from Kennedy to Obama. She’s always well dressed in a simple suit with pearls and she’s always a lady, closing her list of questions with, “Thank you, Mr. President.” In her latest book, co-written with Washington journalist Craig Crawford, Listen Up Mr. President: Everything You Wanted Your President to Know and Do (Scribner, 2009) Ms. Thomas draws on her years of experience as a political journalist and offers valuable lessons to future presidents and you, the voters! Sometimes I feel like a stalker. I follow famous chefs on Facebook and Twitter. I have to say, that David Lebovitz is the only famous author, blogger, chef that has ever replied to one of my comments or tweets. That is not the only reason why I adore David. He is from the Bay Area, did his training at Chez Panisse and now resides in my other favorite city, Paris. David is someone that I have always wanted to meet. Now if I can get a babysitter, I can. For tickets, call 510-652-4412. Charles Chocolates is located at 6529 Hollis St. in Emeryville. The Urban Girl's Manifesto for the San Francisco Bay Area, aka the CRAVE Guide, has been anticipated for months. As of this Thursday, Sept. 10, it will be released at a party 1 block from the ballpark, featuring SFBayStyle. The new book includes over 100 women-owned businesses in the Bay Area - boutiques, spas, bakeries, and service professionals - everything the urban girl needs. And the best part? You're all invited! Hot off the press and sponsored by Battered Bakery, TeaCake Bake Shop, I dream of Cake, Cook! SF, ChefK2, Square Meals and Carolyn Davis Catering, the event promises to be full of sugary sweetness. So please RSVP and come to BoConcept at 101 Townsend St. from 6-8pm on Thursday. One thing that I try to do when traveling is to shop and eat where the locals do. I support locally owned businesses at home, so why not do the same abroad? Thanks to the eat.shop series, I can do just that. The series, which now includes thirteen major cities worldwide, features locally owned businesses selected by the writers. The guides are beautifully designed, and make a great gift. If you want to discover cool boutiques, and restaurants wherever you may roam, this is just the book for you - whether you live here or are just visiting. It started with an egg. One egg resulted in a complete life change for Colorado mother of four, Robyn O'Brien. One morning Robyn fed her baby daughter, Tory her first ever egg and then put her down for a nap. A short while later Robyn checked in on Tory and found the little girl's face bright red and swollen up like a balloon. An ER visit, a dose of antihistamine and Tory recovered. Later the family found out that their daughter had an allergic reaction to the egg she ate and that's where the story beings. Lisa See, author of the New York Times Bestsellers - Snow Flower and the Secret Fan & Peony in Love - will be making the following appearances in the Bay Area to promote her new book, Shanghai Girls. In 2002 I had a life-changing experience: I began to have dramatic allergic reactions to certain foods. My story is a long one, so I'll cut to the chase - I cannot eat eggs or dairy. But even if I could consume these foods without reaction, I wouldn't. Nor do I eat meat and I limit my intake of processed foods. Author and healthy food advocate, Robyn O'Brien knows where I'm coming from. As a toddler, her daughter nearly died from an allergic reaction to eggs. From that harrowing moment on, Robyn began to investigate what exactly is in our food and her findings are not good. Merla Zellerbach, local socialite, columnist and former Nob Hill Gazette editor is celebrating the release of her latest book, Secrets in Time. Set in San Francisco, Zellerbach's novel provides a glimpse into the elite of our fair city during the second half of the twentieth century. The story revolves around three generations of one mega media family and those individuals meandering about them - their secrets, choices, challenges, and fashionable lives. Meet Ms. Zellerbach and hear her read from Secrets in Time on February 12, 7PM at Books, Inc, Opera Plaza, 601 Van Ness, San Francisco. Ms. Zellerbach will aslo read on April 18, 4PM at Book Passage, 51 Tamal Vista Blvd., Corte Madera. Regular readers might recall our profile of San Francisco entrepreneur and man-about-town, Gurbaksh Chahal. Now you can get the full scoop on Chahal's 26 years with the arrival of his published memoir, The Dream: How I Learned the Risks and Rewards of Entrepreneurship and Made Millions. Published by Palgrave Macmillan, The Dream recounts Chahal's journey, from his childhood struggles as a recent immigrant to his remarkable success as a young Internet tycoon and the lessons he has learned along the way. Interspersed are family stories, business insights, and tips on for aspiring entrepreneurs. December 18, 7:00pm, Book Passage in Corte Madera. Sometimes at SF Bay Style, an idea or product will intrigue a few of us. Such was the case when the opportunity was presented to review these stylish planners by San Francisco based Sarah Pinto. Two writers looking at functionality from two very different points of view. Samantha: I am sensory. I need to see and touch my way though the day, which is why although I begrudgingly share a Google Calendar with my husband, I need to have a datebook with me at all times. Easy as it may seem, it is actually quite difficult to find one that fits my life in an efficient and user friendly way, not to mention is aesthetically pleasing. I have no doubt that my routine, while the details may vary, is not much different than many other parents I know. Style expert Clinton Kelly (from the popular television show What not to Wear) says there are four essentials to dressing well: fit, proportion, appropriateness, and good shoes. "Shoes always set the tone of an outfit," Clinton Kelly told an enthusiastic crowd gathered last Wednesday evening at Book Passage in San Francisco. "There's a reason why nuns don't wear stilettos and strippers don't wear orthopedics." Promoting his new book, Freakin' Fabulous: How to Dress, Speak, Behave, Eat, Drink, Entertain, Decorate, and Generally be Better than Everyone Else, Kelly sported a casual look in a pair of dark wash jeans, a multicolored striped shirt, and navy blue blazer. He entertained his mostly female fans offering style tips and answering questions about his TLC show What not to Wear, which he co-hosts with Stacy London. In the crowd was his British grandmother, who at 90 was looking pretty stylish and fabulous herself! The landmark Berkeley book store, Cody's has closed. As a U.C. Berkeley alumnus, Cody's held a special place in my heart. This was the epitome of a Berkeley book store- you could get your copy of any Noam Chomsky novel there ! The store opened in 1952, and closed this past Friday, June 20th. The loss of Cody's is sad for the community in Berkeley and all of the Bay Area. I have many fond memories of wandering through the store on Telegraph Avenue. Just a reminder of how important it is to support our local book sellers in the Bay Area. 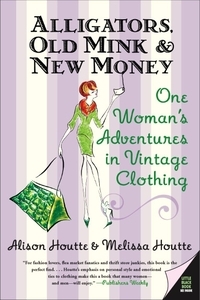 As a lover of all things vintage (almost all things), the book Alligators, Old Mink & New Money: One Woman’s Adventures in Vintage Clothing caught my eye immediately in 2005 when it was published. Since then I’ve read it twice and could enjoy it again and again. Written by Alison Houtte and her sister, San Francisco journalist Melissa Houtte, Alligators is about Alison’s journey from a childhood in Florida with five siblings to a high fashion modeling career in the 1980's to her current role as a vintage clothing fashionista. With a conversational and upbeat tone, Alligators allows readers to feel as if we’re tagging along with Alison on her adventures. We are as excited as she is when she flies from Florida to Paris and makes the rounds (called go-sees) looking for modeling jobs, often sporting a vintage Brooks Brothers suit she had bought at a Florida flea market. Collective account for all bloggers in SFBayStyle site.